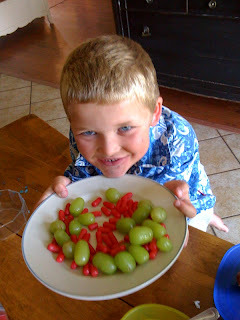 The Christophersons: Sam's Idea of a Salad! leg and a cup of warm Diet Pepsi and his Sunday lunch was complete!!! We are such good parents and let him eat some for lunch. Hey at least he put some grapes in there! That is an Aunt Aimee linch if there ever was one!